This article was re-blogged from Malum Nalu Blog. Malum Nalu is the most read blogger, journalist from Papua New Guinea. He also happens to be my cousin. Thank you bro for sharing this article from Geoffrey Luck. I was ten-years-old when Papua New Guinea received Independence from Australia. I remember that day and what we had to do in school. As a Papua New Guinean and a child at that time, I never understood what the change in my country meant; I guess I was too young to understand. However, over the years, I noticed how things have changed. 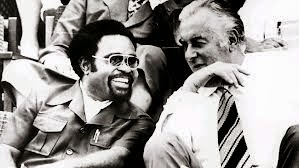 Gough Whitlam and a young Michael Somare at Independence celebrations. Credit: Whitlam Institute. In all the words written about Gough Whitlam, little has been said of one of his greatest ideological and opportunistic initiatives, one of which he was inordinately proud, yet inevitably became one of his many disasters. We know it as the failed state of Papua New Guinea. In the 1960s Whitlam used PNG as a lever to advance his ambitions in the Labor Party. His regular visits culminated in his 1970 tours of the territory inciting radicalism and disparaging the efforts of government, business and settlers in his crusade against what he termed Australian colonialism. Whitlam has been seen as a visionary, but in reality he was a fashionista, shrewdly sensitive to ideas already current in the wider world to which he could sincerely subscribe and could appropriate. So it was with anti-colonialism, the grand international theme of the 60s. It swelled to the nationalistic drumbeat as former colonies gained independence, then ­blossomed as their petty tyrants took triumphant control of the UN organs of moralistic reform. In the first few years of that decade, 30 former colonies of France, Britain, Belgium and Italy secured independence, some after bitter and protracted bloody struggles. The steady Australian policy of uniform development of PNG was contrasted to the frantic Dutch ­efforts to produce a political elite in West New Guinea, as Indonesia sprinkled paratroopers into the swamps of Manokwari. Hugh Foot, the British colonial administrator who lowered the Union Jack around the world, became Britain’s ambassador to the Trusteeship Council in 1961, gamekeeper turned poacher. The next year he led the UN visiting mission that critiqued Australia’s management of PNG, ­demanding a local parliament. In response to these growing pressures, a House of Assembly of 100 members was elected from a common electoral roll in 1964, but the Trusteeship Council and the UN Special Committee on Decolonisation increasingly demanded independence. It was a campaign Whitlam wholeheartedly endorsed, oblivious to the realities of PNG or the wishes of the great majority of the native population. ALP policy under ­Arthur Calwell supported the Menzies government policy of uniform development. Calwell visited New Guinea regularly and was well-informed on territory affairs. Whitlam set out to destroy the bi­partisan approach to PNG ­dev­elopment. It fitted ­con­ven­i­ently with his efforts to ­reform the party and replace ­Calwell as leader. Paul Hasluck, minister for territories and author of the gradualist policy of development, told parliament in April 1961 that Whitlam was using New Guinea as “just another rung on a ­borrowed ladder” for his climb to leadership. In 1965, Whitlam told a World Bank seminar in Goroka that “the world will think it anomalous if Papua New Guinea is not independent by 1970”. A few days later he went much further, in a dinner speech to the 400 most influential Australians in Port Moresby. That speech has never been reported because he pulled one of his most reprehensible stunts. Before he spoke, he called for any journalists in the room to stand up, then asked the four of us to undertake not to report what he was about to say — “otherwise I will not be saying it”, he said. What he went on to say shocked everyone in the room. Only deputy leader and speaking against Labor policy, he warned that as soon as Labor came to power it would announce full self-government for PNG, and immediately set the constitutional wheels in motion to grant ­independence. Whitlam hoped to unnerve Territorians, but not let his party or Australia know. To this day I have been ashamed I didn’t break that undertaking, extorted under such disgraceful circumstances. By 1967 Whitlam was leader, but he narrowly lost the 1969 election. In his notorious tour of PNG in 1969-70, he courted small radical elements such as Pangu Pati while ignoring government officers, and insulting conservative native leaders as “Uncle Toms” and their massed supporters as stooges of Australian colonialism. The tour climaxed in Rabaul where Whitlam blundered into a land and local government dispute. At a mass gathering of more than 10,000 wildly cheering Tolais at Queen Elizabeth Park, what he said, further exaggerated by deliberate mistranslation, was interpreted as support for their rebellion and a promise of independence. Senior administration officers were furious that he had allowed himself to be used. Six months later prime minister John Gorton faced a similar crowd at the same site, but this time raging in fury against Australian government policies. The situation became so threatening the district commissioner slipped Gorton a pistol. In the event, the tension evaporated when the sound system failed. PNG achieved self-government in 1973 and independence in 1975. It was all too early, with too little done. The pressures had come from outside, but Whitlam forced the pace by encouraging and magnifying the ambitions of unrepresentative elites.